According to Pace Dial a Ride 596, the Metra UP WEST line schedule is changing Sept 19 or Sept 18. Is there any information regarding this as no update was issued on Metra website? Press release for new schedule. 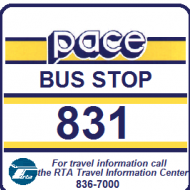 Passenger notice: Correction to Batavia Call-n-Ride schedule regarding UPW train connections. I'm baffled by the non-rush hour skip stop service on the UP West regarding Melrose Park, Maywood & River Forest. Maywood in particular is weird, as it has the 331 Pace Bus that runs every 30 minutes & serves Hines Hospital, Loyola Hospital & Triton College & then goes to the O'Hare Blue Line, which is a way to get to the airport & all the jobs there. Every two hours is ridiculously bad service & doesn't occur on any of the other UP lines. This was discussed before. It appears to be a combination of providing zone service (most lines now have t), perception of demand, and Metra not coordinating with Pace, People going from the city to Hines and Loyola (Lord help them) by transit generally use the Blue Line and Pace 308, and 301 from the west. Whatever the reason is, is it really that big of a deal for off-peak trains to make 1 additional stop, making the service more convenient overall? There's a second, far more serious problem with the UP West Line. There's no station at County Farm Road, where DuPage County moved its courthouse & county offices to years ago. I know several lawyers that are forced to drive there from the Loop because of the lack of a train station, even though the line goes right along the property, within easy walking distance. Exactly who is at fault here? Metra or DuPage County. My guess is that DuPage expected a station there, but being DuPage, they undoubtedly want someone else to pay for it. The Wheaton-Winfield Call-n-Ride provides an hourly shuttle to the Wheaton Metra station, in addition to rush hour 301 trips. Are these lawyers you know "forced" to drive there because they have to be there earlier than 7 AM or later than 6:30 PM? I'd agree with that if we were talking about rush hour service, but off peak trains make all stops. If anybody quits riding the train because of the extra 1-2 minutes an additional stop would take, they would most likely be replaced by multiple people from Melrose Park and Maywood who appreciate the increased frequency. Perhaps due to lengthy delays due to freight train interference, this speeds trains through during off peak hours. Maybe one day a third track will be added in that section, then we will see whether it is a capacity issue due to the nearby rail yard, or if it is a low ridership issue which I still think is the main issue. IIRC, some rush period Rock Island Joliet trains either stop at 95th Street or 103rd street but not both. Some don't stop at either. The common threads? Both 95th and 103rd, like Maywood and Melrose Park, service "minority" neighborhoods that have excellent bus service that connects to CTA L services. If capacity is a bigger issue than low ridership, they should make Maywood a full time station and Melrose Park rush only. This way the park n' ride crowd gets more consistent service while Pace connections are maintained. If the third track were added, I would still say they should make both stops. That's not a great analogy, as 95th and 103rd (main line) are rush only stops, whereas the issue of the UPW stations is that the off-peak service is too infrequent. Also, there are stations at 95th and 103rd on the Beverly branch less than a mile away from the corresponding main line stations, with hourly off peak service. The UPW doesn't have a similar advantage. While the Beverly branch is nearby in terms of distance, it is west of the mainline tracks. Thus people near the mainline tracks are still more likely to use CTA than Metra's service, rush hour or not. I would like to see Maywood And Melrose Park served by all off peak trains as well. Unlike Lagrange and Lagrange Stone Avenue on the BNSF line, Pace service coverage is more than ample. I would like to see hourly service on the ME mainline between 115th and 75th, but ridership doesn't justify the frequency bump. Maywood and Melrose Park haven't complained about the current setup, so I guess it is sufficient for them. Good for Metra and UP, but I’m kind of surprised the people around Geneva allowed that new track by them after all the fuss they made before. 1st Avenue is currently closed for 3rd track installation. 1st Avenue in Maywood at UP RR crossing has reopened to vehicle traffic. It looks like 5th Avenue will be next to close. Deter signs are up though they are currently covered.